Prominent & Leading Manufacturer from Pune, we offer cryo express dry shippers, cx series (cryo express), cryo-ls series lab refrigerators, cryo-k series cryogenic systems, cryo-ld series cryogenic dewars and dig dewar flask. 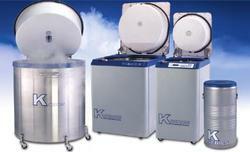 Cryo Express (CX) dry shippers are designed to safely transport a variety of materials at cryogenic temperatures. The unique absorbent material prevents a liquid spill if the unit is tipped over. Storage temperature inside the shipping cavity remains at approximately -1900C until the liquid nitrogen evaporates from the absorbent material. 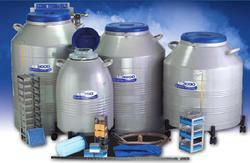 Cryo Express (CX) dry shippers are designed to safely transport a variety of materials at cryogenic temperatures. The unique absorbent material prevents a liquid spill if the unit is tipped over. Storage temperature inside the shipping cavity remains at approximately -190 degree C until the liquid nitrogen evaporates from the absorbent material. Advanced Concept enables faster charging. The Taylor-Wharton Laboratory Systems (LS) are uniquely designed for large vial capacity in convenient box-type storage racks. They provide maximum holding times. This means lower per vial operating costs and fewer refills. The new LS6000 with the AutoTend Controller with temperature read out provides automatic filling and alarm features. The K Series cryogenic systems offer reliable liquid nitrogen storage with controllable temperatures between -1000C to -1960C. Combined with the safety of the automatic alarms and the easy access to stored product, the unique Temperature Gradient Suppression System greatly improves vapor phase temperature storage and recovery. Evaporation rate and static holding time are nominal. Actual rate may be affected by the nature of the contents, atmospheric conditions, container history, and manufacturing tolerances. Work time is an arbitrary, reference-only value to estimate container performance under the actual operating conditions. Maximum depth 55.0 in (1397mm). Maximum height 90.0 in. 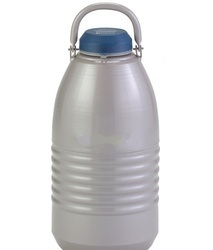 (2286 mm) with lid open. 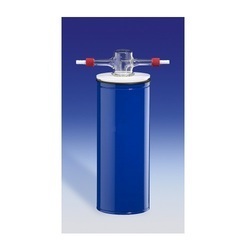 The LD Series of cryogenic dewars are designed for storing and dispensing small amounts of liquid nitrogen.The series includes a beaker style dewar with a wide mouth (LD5) and pitcher-style model for easy pouring (LD4). 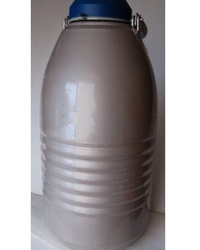 The shape of the Foam Dewar is circular, with a protruding handle, so that it resembles a large teardrop. Each bowl shaped vessel comes with a matching foam lid to insulate the contents from ambient air. The High Capacity (HC) series of refrigerators are designed for storing large quantities of a variety of materials at cryogenic temperatures. Temperatures generally range between -1960C (-3200F) at the liquid surface, and-1900C (-3100F) at the canister top. The low profile Labs Series is designed to provide near LN2 temperatures at the top of the Inventory System and all racks are in vapor. 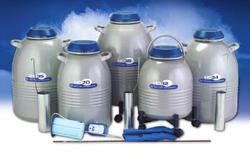 The Labs Series can also be used in full liquid storage. The Labs Series features the intuitive Kryos Control. 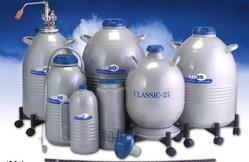 Looking for Cryogenic Refrigerators, Dewars and Freezers ?